Lucas Bolyard, a high school student, helped discover a rare astronomical object. Major breakthroughs in astronomy aren't only reserved for professionalscientists, as proven by a high school student who recently helped discover anew astronomical object. 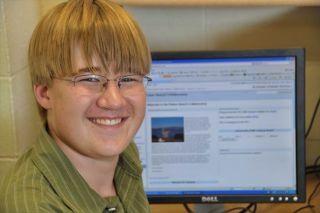 In March 2009, West Virginia student Lucas Bolyard cameacross the signature of the object while working on a project that trainsstudents to help analyze astronomical data. He passed the interesting signal onto supervising astronomers, who determined it was probably a rare object knownas a rotatingradio transient. These strange neutronstars (extremely dense stars made up almost entirely of the subatomicparticles neutrons) emit sporadic bursts of radio waves. There are onlyabout 30 rotating radio transients known. At the time of the discovery, Bolyard, a sophomore at SouthHarrison High School in Clarksburg, W. Va., had already waded through more than2,000 data plots and found nothing. He was sorting through images from the giantRobert C. Byrd Green Bank Telescope (GBT) in Green Bank as part of the PulsarSearch Collaboratory, a joint project of the National Radio AstronomyObservatory (NRAO) and West Virginia University, funded by a grant from theNational Science Foundation. "I was home on a weekend and had nothing to do, so Idecided to look at some more plots from the GBT," he said. "I saw aplot with a pulse, but there was a lot of radio interference, too. The pulsealmost got dismissed as interference." He reported the pulse as an anomaly worth furtherinvestigation, and it went on a list of candidates for West Virginia Universityastronomers Maura McLaughlin and Duncan Lorimer to reexamine. When the astronomers took follow-up observations, they foundnothing in the spot where the pulse came from. This proved that it was not a normalpulsar, which is a type of neutron that rotates, emitting a continuouslighthouse beam of light. In July 2009, the scientists confirmed that the originalpulse signal was real, and not interference, by reprocessing the raw data. Thisindicated that the strange object was probably a rare rotating radio transient. At the time, Bolyard was at the observatory with fellowstudents. They had been observing on the GBT all night and were exhausted. Butwhen Lorimer showed Bolyard the new plot of his pulse showing that it was areal signal, Bolyard didn't feel tired anymore. "That news made me full of energy," he said. Rotating radio transients are thought to be similar to regularpulsars, but they emit intermittently, one burst a time, instead ofcontinuously. This characteristic makes them hard to find - the first one wasdiscovered in 2006. "These objects are very interesting, both by themselvesand for what they tell us about neutron stars and supernovae," McLaughlinsaid. "We don?t know what makes them different from pulsars - why theyturn on and off. If we answer that question, it?s likely to tell us somethingnew about the environments of pulsars and how their radio waves are generated."